On the picture: Two visitors lit votive candles. (From Wikipedia:) In Christianity, a votive candle (or: ‘prayer candle’) is a small candle, white or beeswax yellow, intended to be burnt as a votive offering. They are lit for prayer intentions. To "light a candle for someone" indicates one's intention to say a prayer for another person, and the candle symbolizes that prayer. A donation box intended to defray candle costs generally accompanies votive candles. 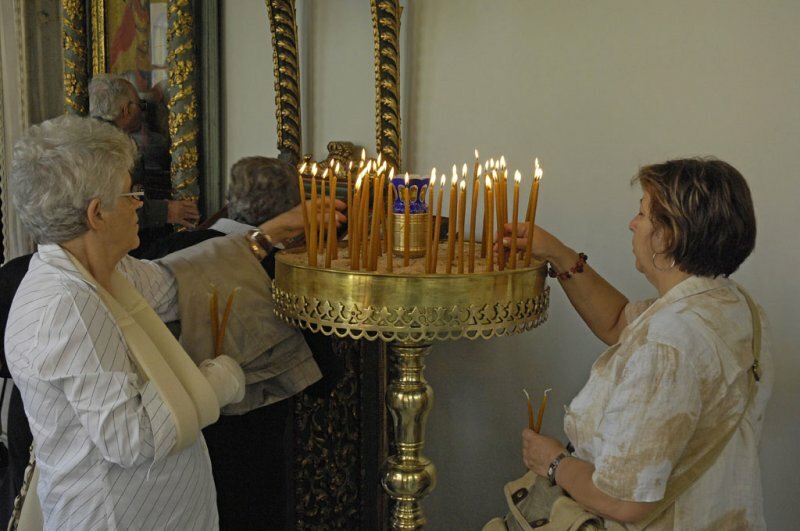 In the Eastern Orthodox Church, candles are lit before icons, usually of Jesus Christ or the Holy Virgin. Usually Orthodox churches only use long, thin candles. These are generally placed in round containers, having either various sockets to hold the candles, or in a container filled with sand, in which the worshippers place their candles.